Jezebel has obtained digital copies of some of the new “conservative” Texas textbooks (the books are available to education professionals but not the general public), and while they certainly aren’t the abomination some activists and educators feared, their contents demonstrate a troubling creep away from teaching actual history—and the unpleasant truth of America’s legacy of racism—and toward a sanitized fable of historical white morality. Initially, some news outlets reported the textbooks omitted Jim Crow laws and the KKK altogether, but, as Texas Monthly pointed out in its September issue, that wasn’t exactly the case. The magazine reassured its readers that the “travesty” of “partisan fiction” had been avoided and that the textbooks, though flawed, were far from an affront to the study of history. But, after examining copies of the 7th grade, 8th grade, and high school-level books obtained by Jezebel, it was clear that this curriculum is riddled with omissions, making frequent use of convenient, deceptive juxtapositions of slaveholder violence and the slave resilience. Sure, Texas’s new textbooks aren’t an outright travesty. But that doesn’t mean they’re anywhere close to good. Slavery is mentioned only briefly in HMH’s 7th grade textbook. It’s not until 8th grade that the subject is expanded upon in a tone that suggests a general unwillingness to clearly state just how horrific of an institution it was. Passages that reference violence often transition to characterizations of slaves as a hopeful, god-fearing bunch whose faith and sense of community when not working or being punished almost negated the nightmarish realities of their daily lives. And, though the violence of slaveholders is mentioned—often with quotes by former slaves—it’s generally followed by a reminder that their lives weren’t all bad. Slavery, the book suggests, was only truly miserable some of the time. For adults, this combination of half-truths and omissions makes for an unpleasant read. For children, it’s something worse: a disservice. Slavery was a viciously brutal condition for many inhabitants of the southern ​colonies. Africans were brought to America to be slaves, sure, but their specific skill set helped change the landscape and and improve the economy! Apart from being too little, too late, that final sentence acknowledging slavery’s brutality evinces the gotta-hear-both-sides structural dodge also found in the previous section, in which six paragraphs on the “horrible experience” of the Middle Passage and slavery are followed by four on its cultural upsides. 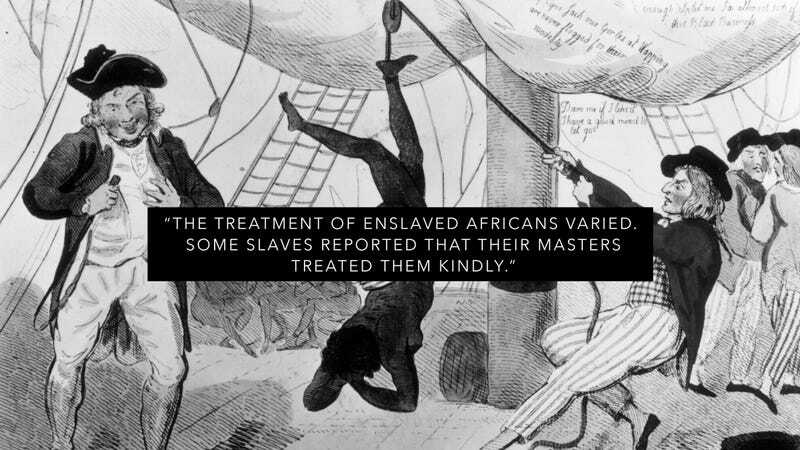 The treatment of enslaved Africans varied. ​Some slaves reported that their masters treated ​them kindly. To protect their investment, ​some slaveholders provided adequate food ​and clothing for their slaves. However, severe ​treatment was very common. Whippings, ​brandings, and even worse torture were all ​part of American slavery. Many slaves expressed themselves through ​art and dance. Dances were important social ​events in slave communities. Like most elements of slave culture, art and dance were ​heavily influenced by African traditions. To further control slaves’ actions, many ​states passed strict laws called slave codes. ​Some laws prohibited slaves from traveling ​far from their homes. Literacy laws in most ​southern states prohibited the education of ​slaves. Alabama, Virginia, and Georgia had ​laws that allowed the fining and whipping ​of anyone caught teaching enslaved people ​to read and write. Many enslaved Africans found comfort in ​their community and culture. They made time ​for social activity, even after exhausting workdays, in order to relieve the hardship of their ​lives. Although they were forced to immigrate ​to the United States, their culture is one of the ​foundations of the current national identity, ​especially in the worlds of music and religion. This “it wasn’t all bad!” structure isn’t the only problem with the book’s discussion of slavery and racism in the United States. The roughest truths are often softened around the edges, sometimes by the addition of just one word. On page 425 of Texas United States History, we learn that, “Generally, slaveholders viewed slaves as ​property, not as people.” Generally. Most white Southerners swallowed whatever resentment they felt over African-American suffrage and participation in government. Some whites expressed their ​​feelings by refusing to register to vote. Others were frustrated by their loss of political power and by the South’s economic stagnation. These were the people who ​​formed vigilante groups and used violence to intimidate African Americans. The most notorious and widespread of the ​​​​Southern vigilante groups was the Ku Klux Klan (KKK). ​​The Klan’s goals were to ​​​​destroy the Republican Party, to throw out the Reconstruction governments, to aid ​​the planter class, and to prevent African Americans from exercising their political ​​rights. To achieve these goals, the Klan and other groups killed perhaps 20,000 ​​men, women, and children. In addition to violence, some white Southerners ​​refused to hire or do business with African Americans who voted Republican. It’s not noted within that section that the “20,000 men, women, and children” killed by the Klan were of a fairly particular group. The Klan also believed ​​in keeping blacks “in their place,” ​​destroying saloons, opposing unions, ​​and driving Roman Catholics, Jews, ​​and foreign-born people out of the ​​country. KKK members were paid to ​​recruit new members into their world ​​of secret rituals and racial violence. “Destroying saloons, opposing unions.” If that rundown of the KKK feels strangely unfinished to you, read this slightly more descriptive account from 1935, written by W. E. B. Du Bois in Black Reconstruction in America. Lawlessness and violence filled the land, and terror stalked abroad by day, and it bured and murdered by night. The Southern states had actually relapsed into barbarism...Armed guerrilla warfare killed thousands of Negroes; political riots were staged; their causes or occasions were always obscure, their results always certain: ten to one hundred times as many Negroes were killed as whites. African Americans and others who did not follow the racial etiquette could face severe punishment or ​​death. All too often, blacks who were accused of violating ​​the etiquette were lynched. Between 1882 and 1892, more ​​than 1,400 African-American men and women were shot, ​​burned, or hanged without trial in the South. Lynching ​​peaked in the 1880s and 1890s but continued well into the ​​20th century. It is, however, absolutely worth noting that HMH’s social studies textbooks contain an abundance of well-written and essential information about the abolitionist movement. Nat Turner’s slave rebellion, the writings of Frederick Douglass, descriptions of the “daring” work done by Sojourner Truth, Harriet Tubman, and Ida B. Wells: all of those topics are covered, as are the efforts of civil rights leaders of the 20th century. But there’s an uneasy feeling that the significance of their achievements will be diminished to schoolchildren when not prefaced with an accurate portrayal of what they were fighting. It’s hard to fully appreciate the results of progress without first being given blisteringly truthful depictions of its origins. In Texas United States History, sections begin with hypothetical exercises called “If You Were There...” which ask students to imagine themselves as various people throughout the country’s history. At some point in chapter 3, you’re asked to step in the shoes of an early settler who’s considering a move back to England. In chapter 8, you’re a Maryland voter choosing between John Adams and Thomas Jefferson. But just one of 63 sections in a book about America from the 15th century to 1877 begins by asking Texas children to imagine life from the point of view of a slave. It’s a halfhearted attempt at empathy, and one that is emblematic of the book’s failure to make readers view slavery in the monstrous, despicable light it deserves. While discussing this subject with my colleagues, Kara Brown said, “The thing about slavery is that I feel like I know a lot about it, but every single additional thing I learn makes me realize it was even worse than I thought.” These textbooks are acutely aware of that sentiment. In the most generous reading, the people who created this textbook do believe young Texans will eventually learn the whole truth. But as educators, they just don’t want to be the ones who told them. Note: The post was updated to add clarification on the source of the textbooks.